Foxconn is always the source of news! Sources in China today reported that a violent explosion occured at around 19:00 local time at Foxconn’s Chengdu manufacturing plant which is one of the key production plants for the Apple iPad 2 tablet. M.I.C Gadget reported that an explosion occurred in the A05 at 7 pm. Speculation is that the explosion might have caused due to the materials casted out from the building. The building however did not collapse however emergency services are at the scene. The most recent update is that the building is in danger of collapsing entirely as the upper floors are reported to have collapsed. This is bad news for the Apple iPad 2 which has already experienced delays due to the recent tragedy that struck Japan. 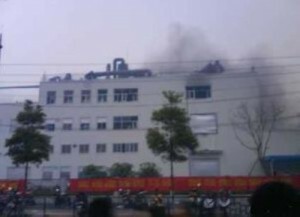 The current situation at Foxconn’s Chengdu factory is likely to affect iPad 2 supplies, yet again. Previous Now UnAuth Internet Streaming to be a Felony! Next Sony Music Site Hacked!